Being a celebrity has its benefits . . . and its costs. Due to his status as the worlds most unusual travel writer-being a thousand pounds of walking, talking rock will do that-Concrete is approached by a group of radical eco-warriors to see firsthand and write about their efforts to save old-growth forest. What begins as a lark soon turns into a harrowing struggle, and Concrete must decide whether to dispassionately observe or to join these people who would risk anything, even life itself, to save the planet. Called the best comic being published by anyone, anywhere,Paul Chadwicks critically acclaimed Concrete is at once rousing fantasy and grounded reality, as thought-provoking and challenging as it is entertaining. 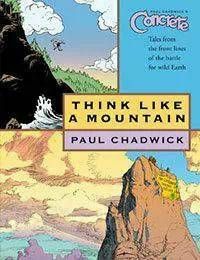 Think Like a Mountaincollects the 1996 Parents Choice Award winning series along with bonus short stories, some collected here for the first time. This value priced volume collects Think Like a Mountain #1-6; short stories: Like Disneyland, Only Toxic, Stay Tuned for Pearl Harbor, A Billion Conscious Decisions, Objects of Value, Steel Rain, various A Sky of Heads stories.